Area: 20,273 square kilometers (7,906 sq. mi.) slightly smaller than New Jersey. Cities: Capital: Ljubljana (2009 pop. 278,314). Other cities — Maribor (112,642), Kranj (54,562), Koper (51,915), Celje (48,993). Terrain: Mountains rising to more than 2,500 meters (8,200 ft.) in the north, wide plateaus over 1,000 meters (3,280 ft.) high in the southeast, Karst limestone region of caves in the south-southwest, hills in the east, and approximately 50 kilometers (39 mi.) of coastline on the Adriatic Sea. Land use (2006): 63.3% forests, 24.2% agricultural land, 12.5% non-cultivated land. Climate: Temperate, with regional variations. Average temperature in the mountain region in January is below 0°C (32°F), in the interior from 0°C -2°C (32°F-36°F), and along the coast from 2°C -4°C (36°F-39°F); in July, average temperature in the interior is 20°C -22°C (68°F-72°F), along the coast 22°C -24°C (72°F-75°F). Average annual rainfall is from 800 mm (31 in.) in the east to 3,000 mm (117 in.) in the northwest. Nationality: Noun — Slovene(s). Adjective — Slovenian. Annual population growth rate (2009): 0.72%. Ethnic groups (2002 census): Slovenes 83.06%, Croats 1.81%, Serbs 1.98%, Bosniaks 1.10%, Hungarians 0.32%, Montenegrins 0.14%, Macedonians 0.20%, Albanians 0.31%, Italians 0.11%, Roma 0.17%. Religions (2002 census): Roman Catholic 57.8%, refused to reply 15.7%, atheist 10.1%, Orthodox Christian 2.3%, Muslim 2.4%. Languages: The official language is Slovene. Hungarian and Italian are spoken in the border regions, and German fluency is common near the Austrian border. Bosnian, Croatian, and Serbian are spoken by a sizable (6% of the population) minority. English is widely understood by business people and students. Education: Elementary school (26.1%), high school (54.1%), 2-year and 4-year university degree (13%). Data according to 2002 census. Health: Infant mortality rate (2009): 2.4/1,000 births. Life expectancy (2009) — 75.76 years for men, 82.31 years for women. Independence: On June 25, 1991, the Republic of Slovenia declared independence from Yugoslavia. 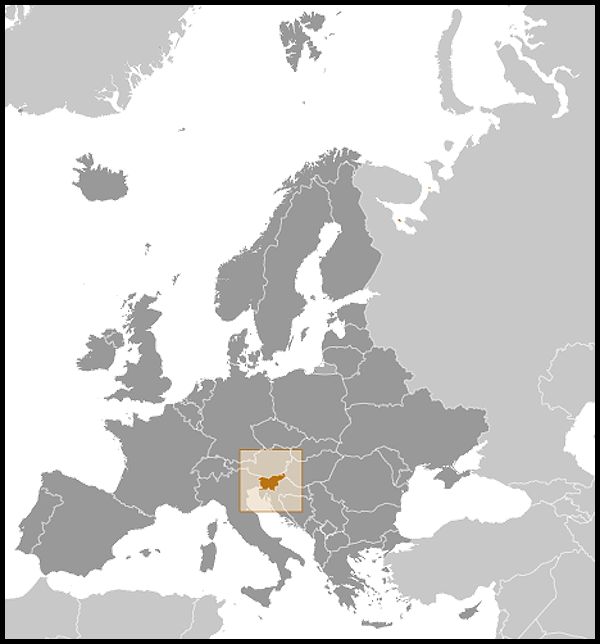 The United States and the European Union recognized Slovenia in 1992. Constitution: Adopted on December 23, 1991. Branches: Executive: president, head of state, directly elected for a maximum of two consecutive 5-year terms. Legislative — bicameral legislature (Parliament is composed of the National Assembly, with 90 deputies directly elected on party basis for 4-year terms, and the National Council, with 40 members elected by the National Assembly to represent social, economic, professional, and local interests for 5-year terms); prime minister, head of government, nominated by the president and elected by the National Assembly. Judicial — Constitutional Court, regular courts, and a public prosecutor. Political parties represented in National Assembly (following 2008 elections): Social Democrats (SD); Slovenian Democratic Party (SDS); ZARES; Democratic Party of Slovenian Pensioners (DeSUS); Slovene People's Party (SLS); Slovene National Party (SNS), Liberal Democracy of Slovenia (LDS); also Italian minority and Hungarian minority representatives. Suffrage: Universal over 18 years of age; permanent residents may vote in local elections. Administrative divisions: 210 local administrative units. Government budget: 10.474 billion euros ($14.663 billion), excluding healthcare and pension fund; defense, 1.55% of GDP and 5.3% of the budget (2010). GDP (2009): 36.386 billion euros ($48.738 billion). Real GDP growth rate (2009): -7.8%. GDP per capita (2009): $23,800. Natural resources: Coal, mercury, timber. Agriculture/forestry/fishing (approx. 2% of GDP): Products — wheat, corn, poultry, beef, pork, milk, potatoes, orchard fruits, wine. Industry (approx. 37% of GDP): Types: electrical equipment, chemical products, textiles, food products, electricity, metal products, wood products, transportation equipment. Services (approx. 61% of GDP): Types: retail, transportation, communications, real estate and other business activities. Trade: Exports ($22.6 billion, 2009): machinery, transportation equipment, manufactured articles, chemical products. To U.S. — Slovenia exported 1.31% of its total exports to the U.S., which amounted to $292.6 million worth of exports (2009). Imports ($23.9 billion, 2009) — machinery, transportation equipment, manufactured articles, mineral fuels and lubricants. From U.S. — Slovenia imported 1.93% of its total imports from the U.S., which amounted to $463.4 million worth of imports (2009). Major trading partners — Germany, Italy, Croatia, Austria, France, and Russia. Trade with the U.S. accounts for 1%-2% of the total trade. Foreign direct investment in 2010: $60.53 million (0.41% of total FDI in Slovenia). Slovenia is situated at the crossroads of central Europe, the Mediterranean, and the Balkans. The Alps — including the Julian Alps, the Kamnik-Savinja Alps, the Karavanke chain, and the Pohorje Massif — dominate northern Slovenia near Austria. Slovenia's Adriatic coastline extends for approximately 48 kilometers (30 mi.) from Italy to Croatia. The term "karst" — a limestone region of underground rivers, sinkholes, and caves — originated in Slovenia's Karst plateau between Ljubljana and the Italian border. On the Pannonian plain to the east and northeast, toward the Croatian and Hungarian borders, the landscape is essentially flat. However, the majority of Slovenian terrain is hilly or mountainous, with around 90% of the surface 200 meters or more above sea level. The majority of Slovenia's population is Slovene (over 83%). Hungarians and Italians have the status of indigenous minorities under the Slovenian constitution, which guarantees them seats in the National Assembly. Most other minority groups, particularly those from the former Yugoslavia, immigrated after World War II for economic reasons. Slovenes are predominantly Roman Catholic, though the country also has a small number of Protestants, Orthodox Christians, Muslims, and Jews. Slovene is a Slavic language, written in the Roman script. Slovenia is today a vibrant democracy, but the roots of this democracy go back deep in Slovene history. According to the 16th-century French political philosopher, Jean Bodin, Slovenes practiced the unique custom of the Installation of the Dukes of Carinthia for almost 1,000 years, until the late 14th century. According to some scholars, Bodin's account of how Slovene farmers contractually consented to be governed by the Duke influenced Thomas Jefferson's drafting of the Declaration of Independence. From as early as the 9th century, Slovenia had fallen under foreign rulers, including partial control by Bavarian dukes and the Republic of Venice. With the exception of Napoleon's 4-year tutelage of parts of Slovenia and Croatia — the "Illyrian Provinces" — Slovenia was part of the Habsburg Empire from the 14th century until 1918. Nevertheless, Slovenia resisted Germanizing influences and retained its unique Slavic language and culture. In 1918, Slovenia joined with other southern Slav states in forming the Kingdom of Serbs, Croats, and Slovenes as part of the peace plan at the end of World War I. Renamed in 1929 under a Serbian monarch, the Kingdom of Yugoslavia fell to the Axis powers during World War II. Following communist partisan resistance to German, Hungarian, and Italian occupation and elimination of rival resistance groups, socialist Yugoslavia was born under the helm of Josip Broz Tito. During the communist era, Slovenia became Yugoslavia's most prosperous republic, at the forefront of Yugoslavia's unique version of communism. Within a few years of Tito's death in 1980, Belgrade initiated plans to further concentrate political and economic power in its hands. Defying the politicians in Belgrade, Slovenia underwent a flowering of democracy and an opening of its society in cultural, civic, and economic realms to a degree almost unprecedented in the communist world. 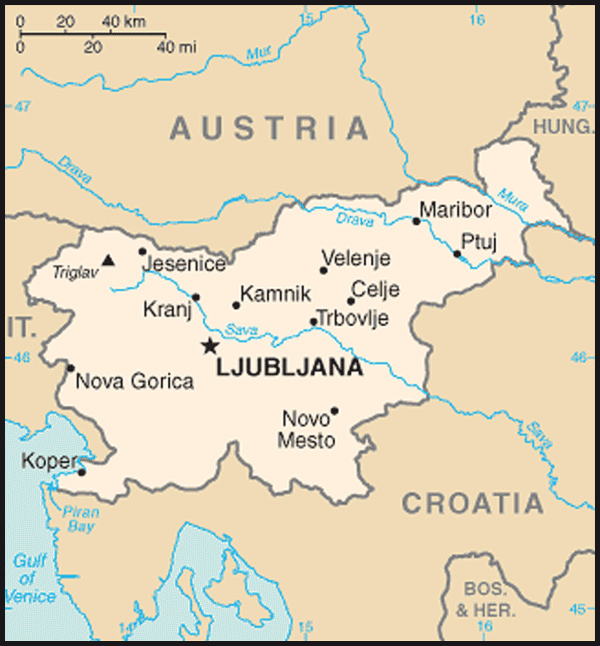 In September 1989, the General Assembly of the Yugoslav Republic of Slovenia adopted an amendment to its constitution asserting Slovenia's right to secede from Yugoslavia. On December 23, 1990, 88% of Slovenia's population voted for independence in a referendum, and on June 25, 1991, the Republic of Slovenia declared its independence. A nearly bloodless 10-day war with Yugoslavia followed. Yugoslav forces withdrew after Slovenia demonstrated stiff resistance to Belgrade. As a young independent republic, Slovenia pursued economic stabilization and further political openness while emphasizing its Western outlook and central European heritage. Today Slovenia is a stable democracy with a growing regional profile. It has increased its international engagement, playing a significant role relative to its size. Slovenia became a member of the North Atlantic Treaty Organization (NATO) and the European Union (EU) in 2004. Since the breakup of the former Yugoslavia, Slovenia has instituted a stable, multi-party, democratic political system, characterized by regular elections, a free press, and an excellent human rights record. Slovenia is a parliamentary democracy and constitutional republic. Within its government, power is shared between a directly elected president, a prime minister, and a bicameral legislature (Parliament). Parliament is composed of the 90-member National Assembly — which takes the lead on virtually all legislative issues — and the National Council, a largely advisory body composed of representatives from social, economic, professional, and local interests. The Constitutional Court has the highest power of review of legislation to ensure its consistency with Slovenia's constitution. Its nine judges are elected by the National Assembly for a single 9-year term. Slovenia's first President, Milan Kucan, concluded his second and final term in December 2002. Former Prime Minister Janez Drnovsek defeated opposition candidate Barbara Brezigar in the 2002 presidential elections by a comfortable margin and was inaugurated as Kucan's successor on December 22, 2002. In November 2007 elections, Danilo Turk succeeded Janez Drnovsek as President of the Republic of Slovenia with 68% of the vote. In the October 2004 election, Janez Jansa became prime minister after his center-right Slovenian Democratic Party (SDS) won a relative majority with over 29% of the vote. Parliamentary elections in September 2008 brought a new center-left coalition to power, with Borut Pahor, head of the Social Democrats, replacing Jansa as prime minister in November 2008. Following the gradual collapse of Pahor's ruling coalition and the loss of a vote of confidence in his government in September 2011, Slovenia held national parliamentary elections on December 4, 2011, approximately 1 year earlier than previously slated. Final, official results and the formation of a new government were pending as of early December. The government and most of the Slovenian polity share a common view of the desirability of a close association with the West, specifically of membership in both the EU and NATO. For all the apparent bitterness that divides left and right wings, there are few fundamental philosophical differences between them in the area of public policy. Slovenian society is built on consensus, which has converged on a social-democrat model. Political differences tend to have their roots in the roles that groups and individuals played during the years of communist rule and the struggle for independence. Since independence in 1991, Slovenia has made great progress in establishing democratic institutions, enshrining respect for human rights, establishing a market economy, and adapting its military to Western norms and standards. In contrast to its southern neighbors, civil tranquility has marked this period, with strong economic growth for much of that time. Upon achieving independence, Slovenia offered citizenship to all residents, regardless of ethnicity or origin, avoiding sectarian complications seen in some central European countries. However, debate continued on how best to accommodate an estimated 25,000 undocumented non-Slovenes who were resident in Slovenia at the time of independence, but whose records were "erased" when they did not take citizenship. Many in this group regularized their status or left the country, but it was estimated that about 4,000 cases remained unresolved. In March 2010, Parliament passed a law granting permanent residency status to those 4,000 that is retroactive to the date of erasure (February 1992). Slovenia accepted nearly 100,000 refugees from the fighting in Bosnia and has since participated in international stabilization efforts in the region. On the international front, Slovenia has rapidly integrated into the Euro-Atlantic community of nations and is one of the focus countries for the U.S. southeast European policy aimed at reinforcing regional stability and integration. The Slovenian Government is well-positioned to be an influential partner for other southeast European governments at different stages of reform and integration, and has introduced initiatives toward this goal, including the establishment of the Center for European Perspective, the Bled Strategic Forum, and the Brdo Process. To these ends, the U.S. urges Slovenia to maintain momentum on internal economic, political, and legal reforms, while expanding its international cooperation as resources allow. U.S. and allied efforts to assist Slovenia's military restructuring and modernization efforts are ongoing. As the most prosperous republic of the former Yugoslavia, Slovenia emerged from its brief 10-day war of secession in 1991 as an independent nation for the first time in its history. Since that time, the country has made steady but cautious progress toward developing a market economy. Economic reforms introduced shortly after independence led to healthy economic growth. Slovenia's economy has benefited from the country's embrace of liberal trade, following the rule of law, and rewarding enterprise. The country has a well-educated and productive work force as well as dynamic and effective political and economic institutions. Despite recent declines in GDP growth, Slovenia has been one the best economic performers in central and eastern Europe, with a 2009 GDP per capita of $23,800. In light of the global economic crisis, the government has introduced measures to shore up Slovenian businesses. The biggest influence on the Slovene economy for 2011 will be the ability of Slovenia's export markets, notably Germany, to recover quickly from the recession. Slovenia already enjoyed a relatively prosperous economy and strong market ties to the West when it gained independence in 1991. Although it comprised only about one-thirteenth of Yugoslavia's total population, Slovenia was the most productive of the Yugoslav republics, accounting for one-fifth of its GDP and one-third of its exports. Since independence, Slovenia has pursued diversification of its trade toward the West and integration into Western and transatlantic institutions vigorously, becoming party to a number of bilateral and regional free trade agreements. Slovenia is a founding member of the World Trade Organization (WTO) and joined the Central European Free Trade Agreement (CEFTA) in 1996. Slovenia also participates in the Southeast European Cooperative Initiative (SECI), the Central European Initiative, the Royaumont Process, and the Black Sea Economic Council. Slovenia became an EU member state on May 1, 2004 and joined the Euro Zone in January 2007. Slovenia joined the Organization for Economic Cooperation and Development Europe (OECD) in 2010. Slovenia's economy is highly dependent on foreign trade. About three-quarters of its trade is with the EU, and the vast majority of this is with Germany, Italy, Austria, and France. The country has successfully penetrated the south and east markets, including the former Soviet Union region. This high level of openness makes Slovenia extremely sensitive to economic conditions in its main trading partners and changes in its international price competitiveness. Keeping labor costs in line with productivity is a key challenge for Slovenia's economic well-being. Gross domestic product growth fell to 3.5% in 2008 after experiencing a growth rate of about 6.1% the prior year. Due to the recession in Slovenia's export markets, GDP fell by about 7.8% in 2009. Services contributed the most to the national output in 2009, accounting for 61% of GDP. Industry and construction comprised 37% of GDP, and agriculture, forestry, and fishing accounted for 2% of GDP. While the service sector is the largest part of the economy as a percentage of GDP, manufacturing accounts for most employment, with machinery and other manufactured products comprising the major exports. International Labor Organization (ILO) statistics put unemployment at 7% (March 2009). Inflation, after declining from 3.6% in 2004 to 2.5% in 2005 and 2006, returned to 3.6% for 2007, and spiked to 6.4% in 2008, but decreased to 1.8% following the onset of the global economic crisis. Energy is at the forefront in Slovenia today as the government considers how to restructure the sector. Slovenia is becoming increasingly dependent on imports of primary energy sources. In 2008, net imports in gross domestic consumption reached 55.3%. This is primarily due to the demand for fossil fuel for transportation (petroleum products) and heating (natural gas). Electricity production and consumption are more or less balanced in Slovenia. The share of renewables, including hydro power, amounted to roughly 11% of primary energy sources during the last 5 years. According to 2008 figures, Slovenia covers 19% of its energy needs with fossil fuels, 37% with petroleum products, 12% with natural gas, 21% with nuclear energy, 4% with hydro energy, and 7% from renewable sources. In view of domestic sources, nuclear power prevails with 44%, followed by fossil fuels with 32%, hydro energy with 9%, and other renewable sources with 14%. More than 58% of Slovenia's surface is covered with forests, providing an ample source of renewable energy. Although Slovenia has taken a cautious, deliberate approach to economic management and reform, with heavy emphasis on achieving consensus before proceeding, its overall record is one of relative success. Economic management in Slovenia is relatively good. That said, the economic crisis of 2008 revealed some of the underlying structural problems with the Slovenian economy. The OECD's Economic Survey of Slovenia 2011 stressed the urgent need for immediate pension reform, drastic changes in distribution of funds available for education, cancellation of pay increases in the public sector, stress tests for the entire banking sector, and introduction of measures to make Slovenia friendlier to foreign direct investment (FDI) in order to increase productivity, rebalance the national economy, and increase competitiveness. Due to its macroeconomic stability, favorable foreign debt position, and successful accession to the EU, Slovenia consistently receives the highest credit rating of all transition economies — receiving the top regional honors in a recent Dunn & Bradstreet survey. Slovenia's ability to meet its growth rate objectives will largely depend on the state of the world economy, since export demand in Slovenia's primary market has stalled. Foreign direct investment will take up the slack to some extent, as analysts forecast FDI levels will continue to increase with further privatization of state assets, including portions of the telecommunications, financial, and energy sectors. Slovenia must carefully address fiscal, monetary, and FDI policy, in light of the high deficit in pension accounts, its vulnerable Western export markets, and inflation concerns. Slovenian enterprises have a tradition of market orientation that has served them well in the transition period, as they moved energetically to reorient trade from former Yugoslav markets to those of Central and Eastern Europe. However, in many cases under the Slovenian brand of privatization, managers and workers in formerly "socially owned" enterprises have become the majority shareholders, perpetuating the practices of "worker management" that were the hallmark of the Yugoslav brand of socialism. Difficulties associated with that model are expected to decrease under competitive pressures, as shares in these firms change hands, and as EU reforms introduce more Western-oriented governance practices. Government efforts and reforms designed to attract foreign direct investment have proven somewhat successful — FDI is continuing to slowly grow. Slovenia's traditional anti-inflation policy in the past relied heavily on capital inflow restrictions. Its slow privatization process favored domestic investors and prescribed long lag time on share trading, complicated by a cultural wariness of being "bought up" by foreigners. As such, Slovenia has had a number of impediments to full foreign participation in its economy. However, a number of these barriers to FDI were fully removed in 2002. Despite these improvements, Slovenia scored poorly in a 2010 World Economic Forum report on FDI openness (116 out of 139 in two categories: prevalence of foreign ownership and rules impacting FDI) and has a relatively low level of FDI in comparison to the region. U.S. investments in Slovenia have been modest; Goodyear is the largest American investor. Even with these successes, much of the economy remains in state hands and foreign direct investment in Slovenia is one of the lowest in the EU on a per capita basis. American companies looking to do business in Slovenia face a challenging environment, particularly if they are interested in selling goods and services to the government. The public procurement process, although compliant with most EU regulations and international treaties, remains opaque and often characterized by favoritism and corruption. After successful resistance to the Yugoslav National Army (JNA) following the 10-day war of independence in 1991, Slovenia faced the challenge of establishing independent armed forces. The Slovene Armed Forces underwent a major reorganization from 2003 to 2005, with the goal of changing from a conscription-based territorial defense force to a professional, deployable, and combat-capable military within NATO. Conscription ended earlier than expected, in October 2003, and compulsory reserve service was to end by 2010. As of 2010, Slovenia's professional force included 7,583 soldiers and 1,654 reservists. The force structure consists of one fully professional motorized infantry brigade and two cadre/reserve force mechanized brigades. The professional brigade represents Slovenia's deployable reaction force. The Slovene Armed Forces also include a small air force, equipped with helicopters and turbo-prop fixed wing aircraft, and a naval attachment, including a coastal patrol boat. The United States provides bilateral military assistance to Slovenia, including through the International Military Education and Training (IMET) program, the Foreign Military Financing (FMF) program, the State Partnership Program (aligned with Colorado), the George C. Marshall European Center for Security Studies, the EUCOM Joint Contact Team Program, and the Regional Counterterrorism Fellowship Program (CTFP). After gaining independence, Slovenia sought NATO membership as part of its strategy of integration into major international economic, financial, and security organizations. After receiving an invitation to join NATO at the NATO Prague Summit in November 2002, Slovenes approved NATO accession with a vote of 66% in a March 2003 referendum. The National Assembly ratified accession to the North Atlantic Treaty in February 2004, and Slovenia officially became a member of the Alliance on March 29, 2004. Slovenia's international commitments reflect its role as a co-provider of security in the region. Slovenia contributed helicopters, medical personnel, military police, and an infantry company to the NATO Stabilization Force in Bosnia and Herzegovina (SFOR) and continues to be very active in the European Union Force (EUFOR). As of November 2010, Slovenia had 17 troops deployed in Bosnia and Herzegovina (ALTHEA, EUFOR, Joint Enterprise, NATO). In Kosovo, Slovenia actively participates in the NATO Kosovo Force (KFOR) with 329 troops. There are 90 Slovenian personnel with the International Security Assistance Force (ISAF) mission in Afghanistan, 14 troops in Lebanon (UNIFIL), 2 in Syria (UNTSO), 3 in Serbia and 6 in Macedonia as part of NATO's Joint Enterprise missions, and 2 as part of EU's anti-piracy mission off of Somalia. The Government of Slovenia has pursued military restructuring, reorganization, modernization, and procurement with the ultimate goal of NATO interoperability. The United States has encouraged Slovenia to maintain the pace of reform — including the establishment of closer links with regional partners — even following its attainment of full membership in NATO. Slovenia has sought to expand cooperative arrangements with neighbors and contribute to international efforts aimed at bringing stability to southeast Europe. Although resource limitations are a concern, Slovenia has taken concrete steps toward an outward looking and constructive role in regional and international security arrangements as resources allow. Slovenia has been a member of the United Nations (UN) since May 1992 and of the Council of Europe since May 1993. From 1998 to 1999, it occupied a non-permanent seat on the UN Security Council and demonstrated a constructive, creative, and consensus-oriented activism. Slovenia signed an association agreement with the EU in 1996 and became a full EU member state on May 1, 2004. The country officially became a member of NATO on March 29, 2004. It is a member of all major international financial institutions — the International Monetary Fund, the World Bank Group, and the European Bank for Reconstruction and Development — as well as 40 other international organizations, including the WTO. Slovenia served as Chairman-in-Office of the Organization for Security and Cooperation in Europe (OSCE) in 2005, served as the Chairman of the International Atomic Energy Agency's Board of Governors for 2006-2007, held the presidency of the European Union from January to June 2008, and chaired the Council of Europe (CoE) for the latter half of 2009. In 2011, Ljubljana became the headquarters for the European Agency for the Cooperation of Energy Regulators (ACER). Slovenia is engaged with 29 countries in bilateral military exchange — most actively with the U.S. — and in regional cooperative arrangements in central and southeast Europe; it is an active participant in Southeast European Defense Ministerial (SEDM) activities. The country participates in or intends to contribute forces for five major multinational regional peacekeeping bodies. The Slovenian Armed Forces has 463 troops deployed to support the International Security Assistance Force (ISAF) in Afghanistan, EU Mission Althea in Bosnia and Herzegovina, the NATO Kosovo Force (KFOR), and other multilateral operations. Slovenia takes an active role in humanitarian assistance, with donations to the victims of the Haiti earthquake, the Southeast Asian tsunami, the Pakistan earthquake, and Hurricane Katrina, as well as ongoing assistance to refugees in Darfur and support for the World Food Program. Through its International Trust Fund for Demining and Mine Victims Assistance (ITF), Slovenia has created the demining instrument of choice for the international community in Bosnia and Herzegovina, the rest of the Balkans, and Central Asia and Cyprus. The organization has raised over $261 million since its inception in 1998 (with the United States contributing over $128 million). Slovenia participates in the Proliferation Security Initiative (PSI) to halt the proliferation of weapons of mass destruction (WMD), their delivery systems, and related materials worldwide. It is party to the Wassenaar arrangement controlling exports of weapons and sensitive technology to countries of concern and has ratified all 13 international anti-terrorism conventions. Slovenia's bilateral relations with its neighbors are generally harmonious and cooperative. However, unlike the other successor states of the former Yugoslavia, Slovenia did not normalize relations with Serbia and Montenegro until after the passing from power of Slobodan Milosevic (although the Slovenes did open a representative office in Podgorica to work with Montenegrin President Djukanovic's government). With its entry into the European Union, Slovenia became a strong advocate for the inclusion of other former Yugoslav republics into Euro-Atlantic institutions. Slovenia's strong political ties to the region are complemented by strong economic ties. Slovenia is among the largest foreign investors in the region. Italy. Italian-Slovenian bilateral relations are very good. By mid-1996, property restitution disputes derived from World War II had been set aside, allowing a dramatic improvement in relations. In 2001, the Italian Senate voted final approval of legislation resolving some minor differences remaining over minority rights issues and over the compensation for property abandoned by Italian refugees fleeing communist Yugoslavia in the postwar period. In the recent past, critics alleged that Italy had not consulted with Slovenia regarding plans for building liquefied natural gas (LNG) terminals in the middle of Trieste Bay and near the Slovene-Italian land border, which could have an environmental impact on Slovenia as well. Hungary. Relations with Hungary are excellent. Hungarian (as well as Italian) minorities in Slovenia are accorded special treatment under the Slovenian constitution, including a permanent parliamentary seat. Within the Multilateral Cooperation Initiative between Slovenia, Italy, Hungary, and Croatia, there is cooperation in numerous fields, including military (Multinational Land Force peacekeeping brigade), transportation, combating money laundering and organized crime, non-proliferation, border crossings, and environmental issues. Austria. Austro-Slovenian relations are close with occasional disputes related to support for the respective country's minorities. In 2005 and 2006 this was dominated by an ongoing question about whether to allow bilingual (German and Slovenian) signage on Austrian territory near the Slovenian border. Questions regarding nuclear power in Slovenia and the basis for the settlement of the Austrian State Treaty appeared to have been resolved in recent years. Economic cooperation is expanding, including a joint project for development of border regions. Croatia. In November 2009, Slovenia and Croatia agreed to send their longstanding border dispute to arbitration, and Slovenia has taken steps to facilitate Croatia's EU accession process. Though some outstanding issues remain, including property rights and Croatian depositors' savings in the Ljubljanska Banka from Yugoslav times, the bilateral relationship has significantly improved since the November 2009 agreement. In March 2010, as a further indication of warming relations between the two countries, Slovenia and Croatia co-hosted a regional forum for Western Balkan leaders in Brdo pri Kranju, Slovenia. In October 2010, the two sides agreed to settle the question of Croatian depositors as determined by the succession agreement in 2001 through the International Bank for Settlements in Basel, Switzerland. Slovenia enjoys excellent relations with the United States and works with it actively on a number of fronts. Since Slovenia achieved its independence in 1991, the two countries have developed strong, cooperative relations on a broad range of issues, from promoting regional security to developing closer bilateral trade and investment ties. The United States was very supportive of Slovenia's entrance into NATO and other Euro-Atlantic agreements and institutions. The first official U.S. presence in Slovenia dates from the early 1970s, when the United States Information Service (USIS) opened a library and American press and cultural center in Ljubljana. From its opening through 1992, the American Center worked to develop closer grassroots relations between the United States and the people of the then-Slovenian Republic of Yugoslavia. On December 23, 1990, the Slovene people voted in a plebiscite to separate from greater Yugoslavia. On June 25, 1991, the new Republic of Slovenia officially declared its independence from the Federal Republic of Yugoslavia. A 10-day war commenced, during which Slovenian territorial troops fought off incursions by the Yugoslav National Army. The United States formally recognized the new republic on April 7, 1992. To develop U.S. diplomatic relations with the new state, the United States opened a new Embassy in Ljubljana in August 1992. Since 1992, the United States and the Republic of Slovenia have developed an impressive track record of cooperation on bilateral, regional, and global issues. The United States has worked closely with the Slovenes to resolve succession issues stemming from the breakup of Yugoslavia. Slovenia provided invaluable assistance to the United States and NATO by facilitating the deployment of the Implementation Force (IFOR) — and subsequently SFOR — to Bosnia after the conclusion of the Dayton accords. With strong U.S. support, Slovenia has developed the International Trust Fund as the demining instrument of choice in the Balkans and has expanded operations to include the Caucasus. On the economic front, the United States has worked to develop bilateral trade and investment with Slovenia. U.S. trade (imports and exports) with Slovenia for 2009 was $628.3 million. Under the Support for Eastern European Democracy (SEED) Act, the U.S. provided technical assistance on enterprise competitiveness, banking and pension reform, competition policy, and debt restructuring. Reflecting the progress Slovenia has made in these areas, Slovenia was among the first transition countries to "graduate" from the SEED program. The United States supported Slovenia's accession to the North Atlantic Alliance and continues to work with the Slovenian military to promote greater cooperation and interoperability with NATO forces. The United States and Slovenia hold periodic high-level security consultations to help Slovenia achieve this national objective. The U.S. European Command provides a liaison team that works with the Ministry of Defense full time to develop greater familiarity with NATO structures and procedures. In October 1997, Slovenia was accepted into the Department of Homeland Security's Visa Waiver Program. To date, citizens of 36 countries, registered in the Customs and Border Protection (CBP) Electronic System for Travel Authorization (ESTA), enjoy the benefit of visa-free tourist or business travel to the United States for periods of up to 90 days. Given Slovenia's economic success and location, its history, language, business ties, and insights into the region, it is an important partner in advancing the shared goal of regional political and economic stability. The utility of this partnership was demonstrated by effective U.S.-Slovenian cooperation on a broad mix of issues at the U.S.-EU Summit held in Ljubljana in June 2008. More than geographically, Slovenia is a bridge into the Balkans, an area that has seen significant diplomatic and security challenges. The U.S. Embassy in Slovenia is located at Presernova 31, 1000 Ljubljana (tel. : +386 1 200-5500; fax: +386 1 200-5555; website: slovenia.usembassy.gov (http://slovenia.usembassy.gov/). American Corners are partnerships between the Public Affairs sections of U.S. Embassies and host institutions, serving as information outposts, similar to a public library reference service and providing access to current and reliable information about the U.S. via book collections, the Internet, online databases, and local programming. Phone: (tel. : +386 (0)5 611-7527; fax: 386 (0)5 611-7530).